Mercedes-Benz shot some photos in Detroit in January of 2018, showing its G-series SUV cruising Detroit streets. 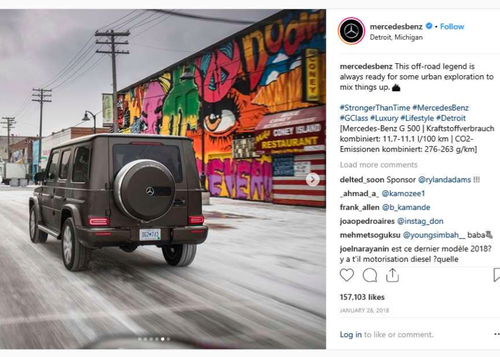 An Instagram post on the corporate account around the same time showed the G-wagon flashing by painted murals in Eastern Market. And thereby hangs a tale, and three lawsuits. In March 2019, Defendant threatened to sue MBUSA for copyright infringement if MBUSA did not pay him a substantial sum of money. MBUSA immediately removed the Instagram post from its account, as a courtesy, but refused to validate this aggressive shakedown. The lawsuits, filed Friday, claim that a year after the Instagram post, artists Daniel Bombardier, James "Dabls" Lewis, and Jeff Soto and Maxx Gramajo threatened copyright infringement lawsuits against the company. Jeff Gluck, attorney for the four artists, said Monday in a statement that “if courts were to adopt Mercedes’ argument, it could destroy artists’ rights for thousands of important and beautiful public works of art," because companies "would be free to use and exploit murals to sell their products, without needing to compensate the artists or even ask their permission." The murals in Eastern Market are a fairly new addition to the city's public-art landscape; surely many more auto commercials have used the Fist in their streetscape scenes; have any of those automakers cleared it with the sculptor, Robert Graham? (Or his estate? He died in 2008.) Would be interesting to know.